One family sets out to experience the spectacular parks of the West in a camper, embarking on a journey that takes them to Joshua Tree, the Grand Canyon, Bryce Canyon, Zion, and the Valley of Fire. The family’s “home” during their eight-night road trip. My son Laszlo’s lifelong dream (which admittedly he hasn’t had for long, since he’s seven) has been to take a trip in an RV. Unlike me, who has never purposely popped the hood of my Mini Cooper, he’s obsessed with all manner of vehicles. But I can relate to his RV longing. Whenever I stayed home sick from elementary school, I would watch The Price Is Right, which always seemed to offer the same two top prizes: a trip to Australia or a motor home. They were also my two dreams. Like Australia, an RV offers the adventure of travel and the similarities of home, only kid-size. An RV also strips away the unnecessary distractions that keep your parents from focusing on you. When I asked Laszlo if these were the reasons he wanted to be in an RV, he looked at me like I was an idiot. “It’s a house on wheels,” he explained. I asked my lovely wife, Cassandra, if she’d be up for taking an eight-night trip to see national and state parks in an RV, going from our house in L.A. to Joshua Tree, the Grand Canyon, Bryce Canyon, Zion, and the Valley of Fire. Unexpectedly, she agreed. This meant I would have to deal with the RV, which seemed impossible since I am not good at taking care of a house or a vehicle — and an RV is both. Unable to blame my wife for not fulfilling my son’s dream, I rented a Winnebago from Apollo Motorhome Holidays, an Australian company with offices in the U.S. I got a 33-foot-long Minnie Winnie, which Laszlo thought was just as good as Kid Rock’s tour bus. It had a toilet, shower, refrigerator, stove, oven, bedroom, dinette that turned into a bed, couch that turned into a bed, and lofted bed over the driver’s area. For $60 more per person, sheets and towels were included. I drove out of the parking lot and crawled along small local roads heavy with daytime Los Angeles traffic, panicked I would scrape off the top, the sides, or entire strip malls. Once we got on the freeway, with its fat lanes made for trucks, I relaxed. Our huge windshield showed a gorgeous IMAX documentary about America. It was only a two-hour drive to Joshua Tree, but we arrived too late to stay in the park. So we drove down a long, dark road and pulled into the Joshua Tree Lake RV & Campground. After turning off the engine, we walked into a small shack, where I nervously approached a large, bearded man who was sitting behind a desk next to firewood and fishing gear. I mumbled that this was my first night in an RV stop. He was friendly and helpful, assigning us a space that Cassandra guided me into like an aircraft marshaller. We ventured out and were surprised to discover that our fellow RVers were not tooth-challenged clans of 13. There was a delicate French family, hipsters with a baby, and two men who might have just been friends — but it made us feel better about the RV lifestyle once we decided that they were gay. Laszlo loved the campground. We rented fishing poles, baited live worms for the first time (which he mostly did), and caught a fish in the tiny man-made lake surrounded by metal sculptures that looked like they had been brought back from Burning Man. Later on, we headed down a dark path to the edge of the campgrounds and looked at more stars than we see over the course of a year in L.A.
Before he climbed up to the lofted bed above the driver’s seat, Laszlo said, “It’s starting to feel like the RV is our home.” I agreed. The RV was small enough that we could literally park the thing in our living room, and yet I felt like I could live here forever. “Isn’t it weird that this is everything we need?” I asked Cassandra. The next morning, after eating cereal around a table that was extra-special because we knew it could become a bed at any second, we decided to skip Joshua Tree, since, unlike the Grand Canyon, no one says on his deathbed that he wishes he’d seen Joshua Tree. So we started on the 315 miles to Williams, Arizona, sharing the driving duties with surprising ease thanks to wide lanes of highway made for Americans like us. I blasted “Holiday Road” from National Lampoon’s Vacation as Cassandra and Laszlo giddily prepared snacks and used the bathroom while still moving. 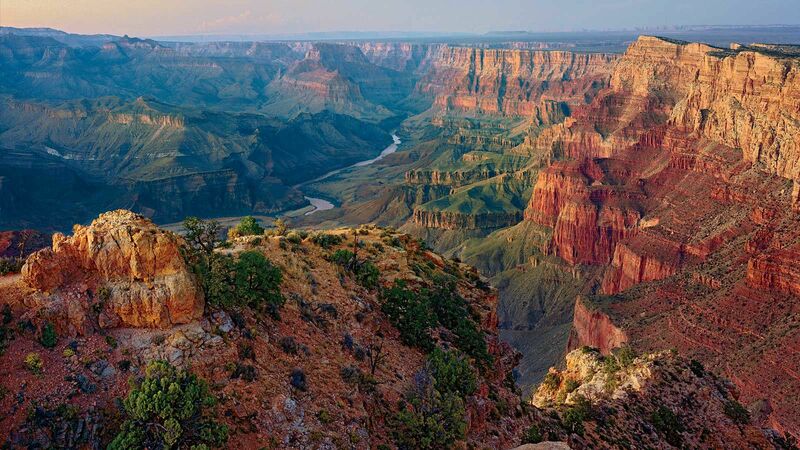 The view from Navajo Point, in Grand Canyon National Park. In a few hours, we arrived at a space reserved in what turned out to be an endless RV parking lot outside the Grand Canyon Railway Hotel. To get a spot inside the national park during the summer, you have to book more than a year in advance, and Williams was the closest town to the Grand Canyon — an hour away. In the 25 years since my last visit, it had boomed into a cheery reimagining of rural 1950s America. The three of us walked into town, thrilled to be reconnected with civilization after our 24-hour withdrawal. Cassandra and I drank flights of Arizona’s finest local wines at the surprisingly cool South Rims Wine & Beer Garage. At 8 a.m., we walked toward the train station for our Grand Canyon adventure. Laszlo said, “I’m sad we’re not going to be in the RV today.” Getting to the South Rim of the Grand Canyon involved a two-hour train ride that came with a show next to the station; Laszlo’s review was two thumbs up, especially the part where the cowboy is shot and dies, but then realizes he’s landed in horse poop and repositions himself. His review of the Grand Canyon: “You just need a peek.” This was my third trip, and gazing down into the incomprehensible enormity of both space and time, I — for the third time in my life — thought the exact same thing. On the train ride home, performers sang old Western songs and everyone joined in. The train was halted by bandanna-wearing horsemen intent on robbing us. More than a few retirees asked the thieves to take their wives, which brought out big laughs. The passengers were the best audience I’ve ever been part of, wholly buying in. I realized that I had been raising Laszlo wrong, that he should be growing up with these nice, earnest people. I asked them where they were from, and they were all places I’d been to: St. Louis, Houston, Las Vegas. The people I encountered there weren’t nearly as nice as this. I needed to raise Laszlo on this train, where we’d be robbed of our jadedness about everything except the Grand Canyon. 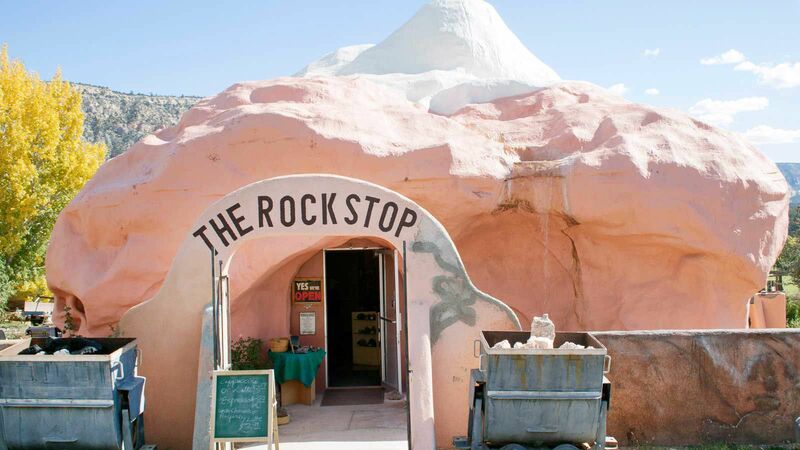 The Rock Stop, in Orderville, Utah, on the road to Zion National Park. The next day, on the way to Bryce Canyon National Park, we stopped at a gas station that had a sign on the door saying 10% OFF IF YOU SHOW YOUR GUN, which is a horrible deal, since if you show your gun in L.A, you get 100 percent off. Though we had lost an hour entering Utah, it didn’t matter. Our family was beholden to nothing but the sun and our bodies — unless we wanted to catch the Bryce Canyon County Rodeo at 7 p.m., which we did. Bryce was amazing: huge drip sandcastles you hike down and around, and I couldn’t wait to spiral into its Wonka-world surprises. But Cassandra and Laszlo weren’t as into walking as you would expect for people who’d planned a trip around visits to national parks. We took Bryce Canyon City’s free shuttle one stop back from the park to our home at Ruby’s Inn RV Park & Campground, where Cassandra sautéed dandelion greens growing right next to our RV’s hookup. (This seemed slightly too organic to me.) After dinner, we went to the rodeo, where toddlers rode sheep, an announcer kept yelling “Fire in the hole!” and all the riders sounded like they were either named Body Miller, Brody Miller, or Brady Miller. We all enjoyed it more than we should have. We had two full days planned in Zion National Park, where I hoped she’d relax into the RV lifestyle like Laszlo and I had. After a two-hour drive with one pit stop to buy sandwiches and, of course, giant crystals, we pulled into a space on the bank of a river and ate a slow dinner by a fire pit. The following day, we took a shuttle into the park. Zion was vast, humbling, gorgeous — and completely uninteresting to Laszlo and Cassandra. By now I’d learned that in national parks, our family likes to spend most of its time having lunch. We ate here in the enormous stone Red Rock Grill at Zion Lodge. After a lunch of salmon cakes, Navajo tacos, and bison burgers, it was time to take the shuttle van to see the highlights. At the first stop, I stared at the Court of the Patriarchs, a grouping of sandstone cliffs, trying to get a sense of what lay inside and on top of these enormous peaks. Cassandra and Laszlo agreed to sit on a bench and let me hike to the top of a waterfall on my own, and when I got there it was even better than I’d imagined: like a pool on the moon. Energized with the wonder of an explorer’s secret knowledge, I bounded back, but I couldn’t even interest Cassandra and Laszlo in my pictures. “I don’t want to see a waterfall. I saw one yesterday,” he said. 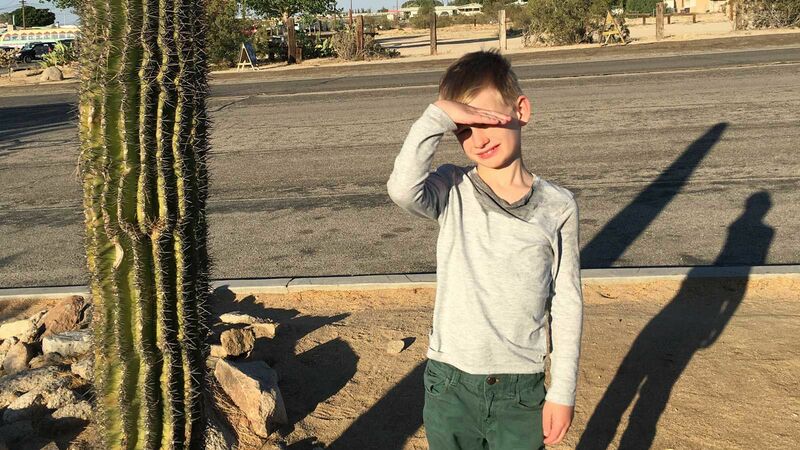 The writer’s son, Lazslo, at the Joshua Tree Lake RV & Campground. On the long drive home, I couldn’t believe how eight days had degraded our parenting. Cassandra and I weren’t just using the bathroom and making sandwiches at 85 miles an hour; we were also lying on the bed reading. There were no rules! Laszlo — who is always strapped into a car seat in the back of our Prius before we pull out of the driveway — sat up front because we couldn’t deny him the views. I wound my way more easily this time through the tight, packed L.A. streets and parked in front of our house. Laszlo wanted to sleep in the RV one last night, 100 feet from our big comfy beds. Cassandra thought this was a bad idea, because of the big comfy beds. Eventually we compromised, and I read to him in his RV bed. Back in our house, Cassandra walked up to me, offering a Riedel glass filled with something red. “I love you so much more outside of an RV,” she said. I realized that she was the only one who had sacrificed for her son. Unprompted, she said she’d do it again if he wanted, only closer and shorter. I stared at her in wonder, realizing I should have loved my wife more inside an RV. To stay overnight at American national parks during the summer months, you may need to make a reservation nearly a year in advance. If you didn’t, reserve a spot at an RV park. The Allstays app locates and reviews options nearby. Apollo Motorhome Holidays: This Australian company recently began operating in the U.S. In addition to motor homes, it rents camper vans and 4WDs in Denver, Los Angeles, Las Vegas, and San Francisco.